The Wilkes-Barre Law and Library Association is the official name of the bar association of Luzerne County, Pennsylvania. The Bar Association is one of the oldest county bar associations in the United States. 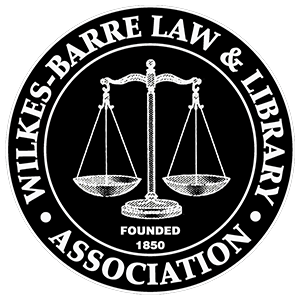 Founded on June 18, 1850 as the “Wilkes-Barre Law Association”, the name of the association was altered in 1855 to the “Wilkes-Barre Law & Library Association” to reflect the important role of the operation of a community law library for its member attorneys. In addition to maintaining the Hon. Max Rosenn Memorial Law Library, the Association also operates The Luzerne Legal Register, the official law journal o luzerne County. A modern-day Lawyer Referral Service is also hosted by the Association for people who need a lawyer but do not know whom to call. Organization: The Wilkes-Barre Law & Library Association is presently governed by a President, Vice President, Treasurer, Secretary and an Executive Committee, consisting of five members. The officers and Executive Committee are elected to one year terms beginning at the Annual Meeting of the Association held in January. For information on who current Officers and Executive Committee are see the Officers & Executive Committee page. For more information about the Law Library, The Legal Register, or the Lawyer Referral Service, please click on those icons on the Home Page.